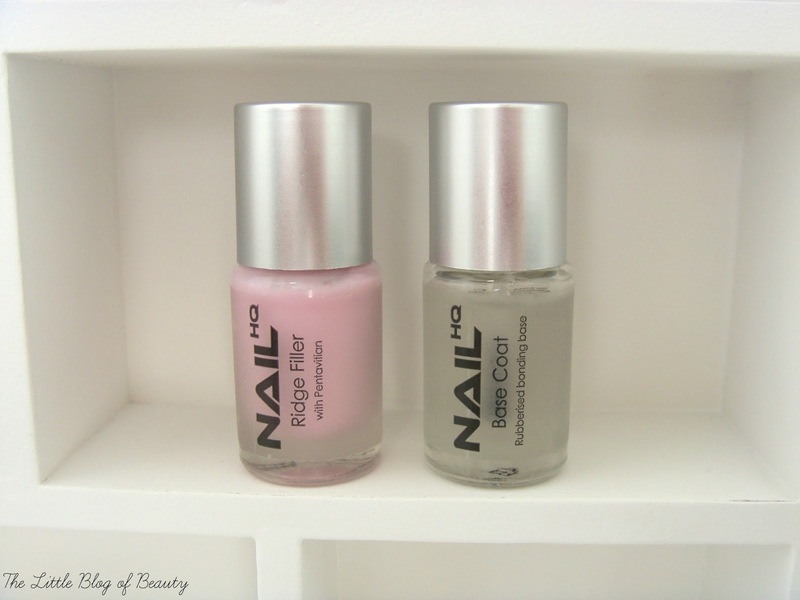 When I was contacted to ask if I'd like to try some products from the Nail HQ range I thought it would be a good opportunity to try out a couple of new base coats. I was sent the Rubberized base coat* and the Ridge filler base coat*. I believe the range includes seven base coats, including hardener, strengthener and growth versions, a gel top coat and a cuticle oil. Prices range from £5.99 to £7.99 and they're available at Tesco and Amazon. The Rubberized base coat (£5.99) contains a formula designed to help nail varnish adhere to your nail. It also creates a barrier to help prevent discolouration when using highly pigmented shades. This is supposed to have a sticky cushioned finish, and having never used one before I expected it to feel quite tacky, but I don't tend to find that it does feel sticky. I have nails that even supposedly long lasting nail varnishes just don't last on so I was really pleased I received this one so I could see if it would prolong the life of nail varnish. This may have helped my nail varnish last a little longer than usual, but not by a particularly noticeable amount of time. That's not to say that this doesn't work well though, it may just not work very well with my nail varnish destructing nails! I was also really pleased to receive the Ridge filler base coat (£5.99) as I do have quite ridged nails. In fact my nails are really strange! For a start they grow curved and my thumb, ring, and little fingers nails are so curved they pretty much make perfect semi-circles. They're also not smooth but are ridged right the way across each nail, like if you take a piece of paper and fold in a concertina but with the folds all the same way rather alternating different ways. On a couple of nails I also have like fault lines that run right down the nail from the cuticle to the tip and I've been told these will never go. The ridge filler is supposed to smooth the surface of the nail, provide hydration and condition the nail to help it be more flexible, regulate growth and improve the wear of nail varnish. This one has a light pink tinge to it and it effectively creates a new surface on the nail that is smoother and because of the pink tinge looks very nail like. When I'm wearing glossy nail varnish I don't particularly notice the ridges in my nails but these do become more obviously if I wear matte nail varnish or use a matte top coat. I think this is because a glossy finish bounces light back off the nail which hides the ridges, but when the surface is matte it tends to highlight them. So I tend to use this base coat if I'm going for a matte look on my nails. This does a great job of reducing the appearance of the ridges on my nails, it doesn't smooth them over completely, but it does minimise them and make them look less obvious. Although I'm not sure that the rubberized base coat did particularly prolong the life of my nail varnish I will continue to use this to try and help prevent staining on my nails, as I do paint them a lot and it is a nice base coat. I will also keep using the ridge filler base coat when I'm going for a matte look.